Are you wondering how to rev up an oncoming party, get-together, or any other form of celebration? It’s simple! Buy or rent a karaoke machine! You see, nothing gets people on their feet and interacting like singing. It’s something that we all love to do regardless of how raspy or heavenly our voices are. It’s, therefore, quite hard to find someone who doesn’t enjoy any music. Now rather than singing along to your favorite song, a karaoke system stirs things up to make it a bit more fun. It streams the lyrics and plays the tunes in the background but lets you put the vocals. So you literally take the place of the artist while your guests listen to you. Taking part to hear to each other sing is a feeling that just can’t be beaten! A few decades ago, karaoke systems were damn expensive. As such, they were mostly limited to bars. Luckily, the stiff competition in this industry has made owning one quite easy. Even better, technological advancement has brought tremendous improvements to these systems. Most of the recommended karaoke systems for parties, for instance, allow you to record the karaoke and save it for listening later. Some also have pitch correction features and effects that make your voice a bit pleasing. These things do so much more as you’ll soon find out. Whether you are looking for kid's or adults karaoke machine, here are our picks. They are great for home and commercial applications. Maono AU-CO4 Karaoke machine is, hands down, one of the best portable karaoke equipment out there, period! It’s one of Maono’s latest and most affordable karaoke systems. So consider its current price just an entry price that may shoot with time. This system measures 14.2 x 13.4 x 7.4 inches and weighs 6.8 pounds only. That said, you’ll have the easiest time taking it with you wherever you want to boogie. In fact, it has a heavy-duty strap for one-hand carrying. Maono AU-CO4 has lots to offer in its performance department. It features a 20-watt speaker and 6.5’’ woofer that can blast loud enough for a 150-people party. In a bid to make it the best portable karaoke system under 100, it comes with a 2200mAh battery. This battery recharges fast and can offer you anywhere between 2 and 6 hours of non-stop karaoke depending on how loud it is. It lacks a screen. So you’ll have to read your lyrics from your iPhone or laptop. On the same note, Maono AU-CO4 has several wireless music source options; laptop, iPhone, Chromebook, Mac, or Samsung Galaxy. You can also connect your devices via Bluetooth. Maono ships with one UHF microphone. Its audio quality is great, and its volume can be adjusted separately from the mic’s volume. It’s also easy to operate and, therefore, great for your kids too. For those looking for the best karaoke system for professional use (maybe in a pub or a bar), VocoPro DVD Duet may be a good bet. There are no limitations, though. You can also purchase it for home use and use while on the go. VocoPro earns a lot of points regarding audio clarity and loud volume which is ideal for karaoke parties. For precision, this machine is fitted with 4 2-way speakers each with a maximum power output of 80W. To make it even better for large karaoke parties either at home, church or school celebrations, you’ll find a pre-out jack that allows you to connect its amplifier to your external sound system. Thus, you can use it as a PA system by itself. The sweet spot about this professional karaoke machine is that it includes all you require to kick off immediately; power cables, 2 microphones, and output jacks. The 2 microphones are professional quality, and their volume can be controlled independently. It also boasts a 5-band graphic equalizer that you can use to tweak the tone to the singer’s taste. What are you looking for, a professional karaoke system with enough sound for a big crowd? Do you want a unit you can move around with much ease? Well, Pyle PKRK212 Vibe needs your attention. Worth pointing out is that this unit doubles as a PA system and a karaoke machine. So if you’re in need of these 2 units, but you’re strapped for cash, you don’t need a second thought here. This Pyle Karaoke system is huge and has loud, clear audios that can’t be ignored easily. Check this out: 2 10’’ woofers and 2 3’’ Piezo tweeters powered up by up to 1000 watts of power and backed up by a ported enclosure design that punches the bass even further. Its high-end amplifier may be powered through a power cable or via a built in heavy duty battery. That said, you can take the karaoke anywhere without power limitations. In fact, to make moving it easy, Pyle Vibe has 2 rollers and a strong retractable handle to take it wherever you want. What makes it the best for professionals is the inclusion of a 7-inch digital LCD screen. So the reader can sing while holding only the VHF mic. Pyle Vibe can play your music from DVDs, Flash Drives, and Memory cards. There’s also an Aux input for your laptop or phone. One thing that stands out with Singing Machine STVG785W is that it’s designed for use by both children and adults. Sure! And it costs around 100 bucks! This is a great way of cutting down on your rather expensive karaoke-outs and also letting your kids have some fun too. Like Pyle Vibe above, Singing Machine STVG785W is a standalone unit that packs everything that you need in a compact karaoke machine. It has a built-in speaker and a 7’’ LCD screen that displays the lyrics for you. It also has easy and intuitive controls and does not require lots of tweaking to get it working. Importantly, Singing Machine STVG785W features 2 microphone inputs for duets. However, it ships with only 1 mic. So you’ll need another microphone for 2 singers. You may also bring wireless microphone system on board and use it to connect up to 8 microphones according to the number of users. Lastly, this karaoke machine can connect to a large TV screen via RCA output jack for multiple users. Karaoke USA GF842 has almost everything that you’d require in a karaoke system for home. One of its outstanding features is its bright LEDs that flash to the rhythm of the music. The lights will look great especially in a low-lit room. They’ll also add some life and excitement to your backyard karaoke parties in the evenings. They also make this machine the perfect gift for your kids. Karaoke USA measures 13 x 10 x 17.8 inches and weighs around 10 pounds. That said, moving it around your home or any other location shouldn’t cause you much trouble. What’s more, this machine comes with a CD with 300 MP3G songs. Again, you can play your favorite tunes from any karaoke CDG or DVD. Even better, this machine has Bluetooth connectivity. So you can stream your music from your Bluetooth devices wirelessly. For the lyrics, this karaoke machine features a 7-inch color screen. An interesting bit of this screen is that you can also use it to watch movies too. You can also connect your game consoles to this unit and play via its screen. You were right. No list of the great karaoke machine reviews would be complete without the SGTX1. This unit has cemented itself as one of the most advanced models with everything that the singer requires in a small footprint. One feature that stands out with Singtrix SGTX1 is its compact design. It’s like a microphone stand with an independent speaker box. As such, it’s among the most portable karaoke machines on the market today. This machine has been tailored for all singers; good and bad. It’s preloaded with over 300 sound effects that cover all music genres. These effects coupled with the built-in pitch correction technology make bad voices sound good and good voices amazing. On the same note, Singtrix SGTX1 has HardTune and 4-part harmony effects that make the solo singer’s voice appear like a whole choir backing him/her. That’s not all. This karaoke also plays songs from numerous sources; phones, computers, tablets, and iPhones. You can also download your tunes from Singtrix App and sing to them. Another brilliant feature here is that you connect a guitar or keyboard and play and sing to your own tunes. Worth noting, Singtrix SGTX1 karaoke machine does not have a display. So you’ll require your phone or tablet for that. Singing Machine SML-238P is another great karaoke for kids. It’s a standard all-in-one unit with a CD+G player, microphones, and speakers designed to give your kids an easy time when boogieing around the house. To be precise, Singing Machine SML-283P measures 4.1 x 9.1 x 9.9 inches and weighs only 1 pound. These measurements make it easy for your kids to lug from room to room with great use. It also has an easy setup. All the controls on the front panel are well labeled and easy to understand. Even better, this karaoke machine for kids can be powered by batteries- an alternative if you don’t like your kids using electricity in your absence. About performance, SML-283P has 2 microphone inputs. It, however, ships with 1. So you may require a second one for 2 users. It has a separate master volume control knob and another one for the microphones. You can also balance the music and the singer’s voice and also control the echo for clarity. This pink karaoke machine has another push button that turns the LEDs ON/OFF. The SML385BTBK is a solid offering and an affordable karaoke machine for parties. It’s also one of the best-selling karaoke below 50 bucks. This machine has everything you need on board apart from a screen. However, it offers a way of connecting it to a TV screen to display the lyrics there. Among other features that makes great for parties is its LED lighting system. It has 2 digits LED display and another stream of 54 LED disco lights. These lights can be turned on or dimmed via a slide button located just above the mic volume knob. Again, this machine features 2 microphone inputs making it great for duets. The output can be controlled via the Automatic voice control, balance, and mic volume, knobs. The SML385BTBK is a top-loader karaoke machine. It plays music from CD+G discs. It also offers an audio plug-in so you can play your music from phones and tablets. The only downside, as mentioned before, is that it has no screen to display the lyrics. As such, you’ll need to carry your phone with you. However, this is quite understandable given its great price. The Electrohome EAKAR300 is hard to ignore if you are looking for an affordable and stylish karaoke machine for home use. It has a sleek modern design featuring a shiny jet black profile and a blue stripe. It also has an appealing and intuitive control panel at the top featuring 5 knobs and a number of push buttons. They have all been labeled so your kids can also control it. Electrohome EAKAR300 is a top loader. It takes CDG and CD discs. It also has an audio cable. So you can download your favorite music to your phone or tab and play it through this machine’s speakers via the aux cable. Unfortunately, this unit does not offer a screen for your lyrics. However, if you don’t mind reading the lyrics from your handheld phone, this shouldn’t be a problem to you. You can also connect it to a large TV screen, anyway. Given its small size, Electrohome EAKAR300 doesn’t get so loud. So for big parties, you may want to connect your sound system for a louder boom. On the upside, it has crisp sounds and several voices enhancing effects including Auto Voice Control (AVC) for rich and in-tune sounds. Ion Audio’s Tailgater Ipa77 is currently the best-selling professional karaoke machine on Amazon. This unit capitalizes on where other models fail to offer you the best bang for your buck in terms of functionality and durability. Firstly, Tailgater is more of a public address system. No wonder you can’t see a screen on it. Fortunately, you can stream your music from a Smartphone, tablet, or computer through its Aux cable while reading lyrics from the phone’s screen. The juicy part is that it’s battery-powered. It has a built-in rechargeable battery that can last up to 50 hours on a single charge. The battery also acts as a charger for your devices. In addition, Tailgater iPA77 has a downloadable App that you can use to DJ from anywhere within the party. This app is compatible with both iOS and Android devices and connects to the machine via Bluetooth. The only slight problem that we found with this karaoke system is that it has no wheels or carrying handles. However, it’s compact and weighs only 17lbs. Again, it also acts as an AM/FM receiver. Are you in need of a karaoke machine that you can use to throw karaoke parties at your backyards, beach, or in camps? You’ll need to consider its size, source of power, and weight. Most portable karaoke machines have either built-in or removable batteries. What matters is how long the battery can last per charge. By the same vein, you’ll also want an all-in-one system with speakers, screen, and microphones in one unit to make lugging around easy. Most karaoke machines have built-in screens that display the lyrics for the singers. While some have small 14-15 inches displays, others have huge screens that can be mounted on walls so the audience can read the lyrics too. Even better, others allow you to tether them to large TV screens thereby making displaying and reading the lyrics easier. Here, consider the number of microphones included in the karaoke system. Most of them ship with only one. Others bring 2 which are great if you want to perform a duet. For those that ship with one mic, consider if they have an extra microphone input so you can add another mic when need be. Consider how clear or loud the audios are in regard to the size of the area the machine is used in. For the standalone units with built-in speakers, they should be loud enough for the audience. If you plan to connect the machine to external speakers, consider its amplifier strength in relation to the size of the speakers. Another biggie feature worth considering is where the karaoke machine streams its music from. Most of these systems come loaded with tones of songs. Unfortunately, not all of these songs are desirable. Some may be so yesterday for you. Luckily, most of these karaoke machines can source music from phones, tablets, laptops, USB sticks, or SD cards. The more versatile it is the better for your parties. Age of the users- Are you looking a kids karaoke machine? 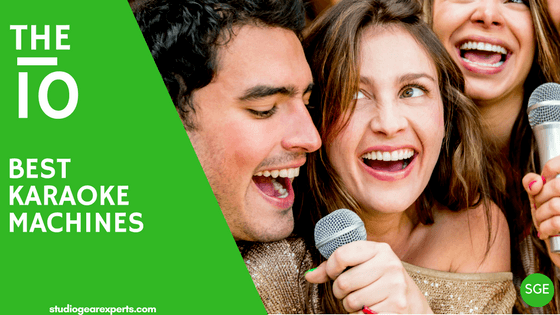 A karaoke machine is a sure way of adding instant fun in parties and gatherings. The availability of compact and inexpensive karaoke systems make these units great additions on any family vacation too. The juicy part is that they are ideal for adults and children too. We hope that you’ll find the best home or professional karaoke machine from our picks. Again, feel free to post any question or add a unit that you think should be on this list in the comments section.